With Thanksgiving sneaking up on us, I wanted to share some recipes that can be served as side dishes for the holidays. First up is this recipe for rice pilaf with roasted broccoli. I love rice pilaf – it’s fluffy, tender and cooked with flavorful aromatics and herbal thyme. 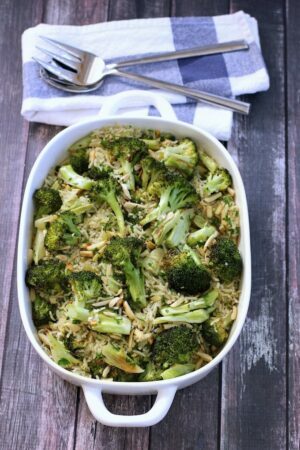 Adding roasted broccoli and toasted almonds makes the pilaf more substantial and filling with a great nutty taste. Rice pilaf is a great way to pack a lot of flavor into a rice dish. The key to a good rice pilaf is to have fluffy, individual grains of rice – not clumps. The rice is sautéed with aromatics (onion, celery and garlic) until it’s translucent and slightly toasted. Next add some thyme and veggie broth – both boost the flavor of the rice pilaf. Finally toss with some fresh parsley, roasted broccoli and toasted almonds and you have a flavorful, filling side dish. If you’re not a big broccoli fan you can substitute a number of veggies. Roasted asparagus, green beans or brussels sprouts would all be good additions. When toasting the almonds, you need to keep an eye on the pan since they go from “hey, these aren’t getting brown at all” to “Yikes, they’re burning” really fast. So toast them in a sauté pan over medium heat and keep them moving in the pan by stirring them or shaking the pan gently – it should only take a few minutes until they are toasted. You definitely what to use a fragrant, nutty rice here – basmati or jasmine is the way to go. If you don’t have vegetable broth you can use a bouillon cube with 1 3/4 cups of water instead. Just cut up the bouillon cube so it will dissolve faster. You’ll be cooking the broccoli and rice at the same time. So prep everything so it’s all cut and ready to go. Start by making the rice and once that’s simmering on the stove top, pop the broccoli in the oven. They should both finish roughly the same time. 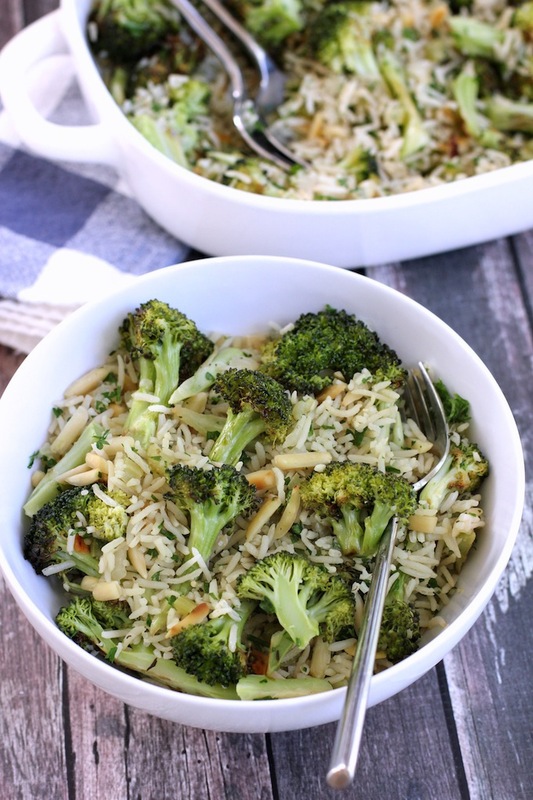 Rice pilaf with roasted broccoli and almonds. A fragrant rice pilaf with roasted broccoli and toasted almonds – a perfect side dish for Thanksgiving. Add 2 tbs olive oil to a sauce pan over medium/low heat. Add diced onions, celery and minced garlic to the sauce pan. Stir occasionally until onions are soft – about 5 minutes. Keep the heat on the low side so it doesn’t burn. Add the basmatic rice and dried thyme to the onion, celery, garlic mixture and stir for 2 minutes until the rice becomes translucent. As soon as the rice is boiling, turn down to low – the lowest your burner will go and cover the sauce pan with a lid. Set the timer for 17 minutes. When the rice is done, remove it from the burner – do not take the lid off – let it rest for 10 minutes with the lid on before fluffing with a fork. While rice is cooking, toss the chopped broccoli with 2 tbs olive oil and black pepper. Spread broccoli evenly onto a large baking sheet and put into the oven. Set the timer for 15 minutes. After 15 minutes, remove broccoli from oven, stir and add 2 minced garlic cloves. Put broccoli back in the oven for 5 minutes. Toast almonds in a frying pan over medium heat for 2 minutes until lightly browned. Be careful that they don’t burn. When rice has rested for 10 minutes, fluff with a fork and add to a large bowl. Add roasted broccoli, toasted almonds and parsley. Toss to combine and serve. I love the look of this, I particularly like roasted broccoli and have you tried roasted cauliflower? A family favourite of ours! Hi Anna – roasted cauliflower sounds like a great idea – will definitely be trying that soon. Thanks! Pilaf is one of my favourites! Love the roasted broccoli, so good! Thanks for sharing this delicious recipe! Hi Geraldine! This looks absolutely fabulous! I have never roasted broccoli before!? But I hear it brings out its best flavors.. paired with almonds, onion, garlic and herbs and flavorful basmati rice, this dish wouldn’t last long in my house! It is hard to believe Thanksgiving is quickly approaching! My goodness! Thanks for this flavorful recipe, Geraldine! Hi Traci – Roasted broccoli is great – give it a try. Time is just flying isn’t it – I’m seeing Christmas decorations already! I love simple side dishes like this, and bet this has wonderful flavor from the onion, garlic and thyme. I can’t believe Thanksgiving is coming up so soon! It’s great to start thinking about meal planning in advance, so thanks for sharing the idea! It’s amazing how fast this year has gone – I can’t believe it’s November already! Have a great night, Julia. Yummy! I’ve made a very similar dish but with toasted cashews because that was what I had. It was really good. Such a good, cheapish and crowd pleasing side dish. Thanks, Genie – cashews sound like a wonderful addition – I’ll try those next time (if I can keep them in the house without eating them all 🙂 Have a good one!